I was all ready to work on a bunch of 2012 Project Life layouts and the first fresh layout for 2013 when this happened. At first I was bummed, because I wasn’t sure where to direct my creative energy, but then I remembered that I still had a week’s worth of printed photos for my Project Life 2011 in 2012, which I guess is Project Life 2011 in 2013 now. 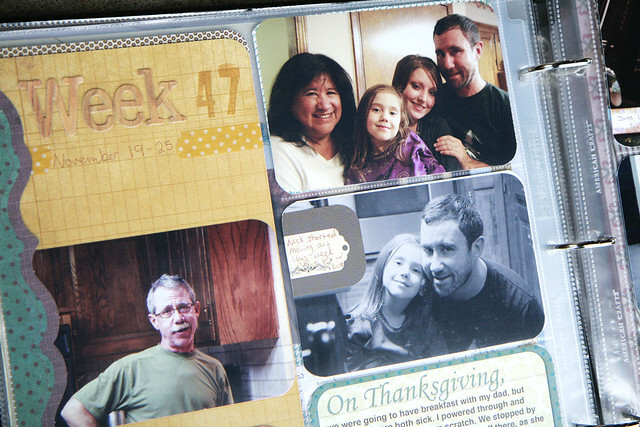 This spread is Week 47, covering November 19-25, 2011. I used this 365 2011 post to grab the documentation for this week. I say this over and over, but this is proof that you should keep documenting with photos and words, even if you don’t feel like you have time for memory keeping. If I hadn’t written things down, I never would have been able to do a project this in-depth about the past. You never know when you’ll have a great documenting idea or a burst of creative energy! This side is all about Thanksgiving. I used Allie’s Document Life Workshop Thankful Cards, but printed them all on lightly patterned paper so that they’d match the color scheme. So in love with how they turned out. Then lots of great everyday stuff: packing orders, buying records, and testing typewriters for our Etsy shop, shopping, watching TV (that cute TV embellishmentis from Hey Jen Renee! ), shopping, reading, and walks. I love the everyday stuff the best. Though this week looks happy, it was actually really horrible. Jake’s grandma Mary Lou died. I’m planning on adding her photo and words about what a wonderful woman she was in an insert. 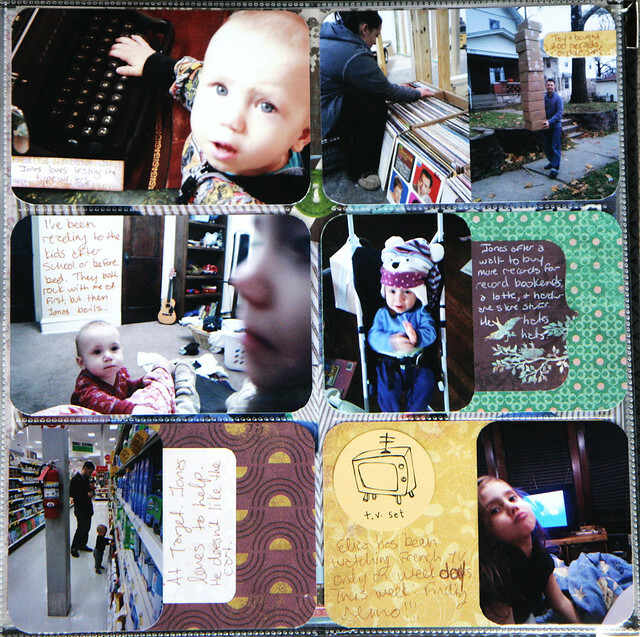 Read about my process for using PL to document the past in the Project Life 2011 | Week 1 post. Or you can read all posts tagged Project Life 2011. To learn how I make photo collages in Photoshop, read here. Check out Project Dig Deep, the first ebook on Project Life! 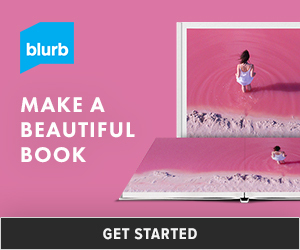 I’m a contributor, the other contributors are rad, and there’s a foreword from Becky Higgins. You can’t go wrong. Awesome choice of colors for this spread, I absolutely love it ! Also looooove the genius idea to use the white wall on the photo to add your journaling, this is awesome ! Thanks, Sandrine! The colors were a happy accident. I was shifting papers around so I could have an empty folder for all of my One Little Word folder, and these papers (which are all from one collection, from My Mind’s Eye) were on top! They’re perfect for Thanksgiving. I love the plum color. It’s hard to find good purples. I can’t believe how much you’ve got done for 2011! It feels like you just started going back to do that. Good job powering through! I’m not “really” on week 47. 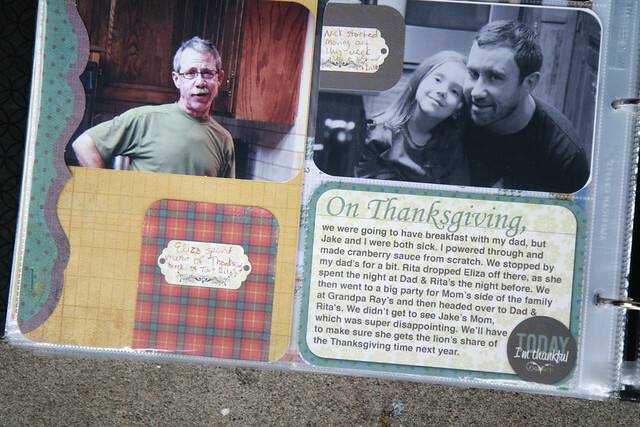 I was just feeling November-y in November 2012, so I printed all of the November 2011 photos too. I’ve done 1-9 and and 45-47, I think. Which is confusing for you guys, probably, but works for me.